Rep. Scalise To Undergo Another Surgery As Part Of Shooting Recovery : The Two-Way Scalise was wounded in June when a gunman opened fire on Republican lawmakers practicing in a Washington, D.C., suburb for a charity baseball game. House Majority Whip Steve Scalise listens as five officers are presented with medals during a ceremony in November. The officers were honored for risking their lives to save others when a gunman opened fire on the GOP congressional baseball team's practice in June. U.S. Rep. Steve Scalise said Tuesday that he has made "tremendous progress" since being shot last June. 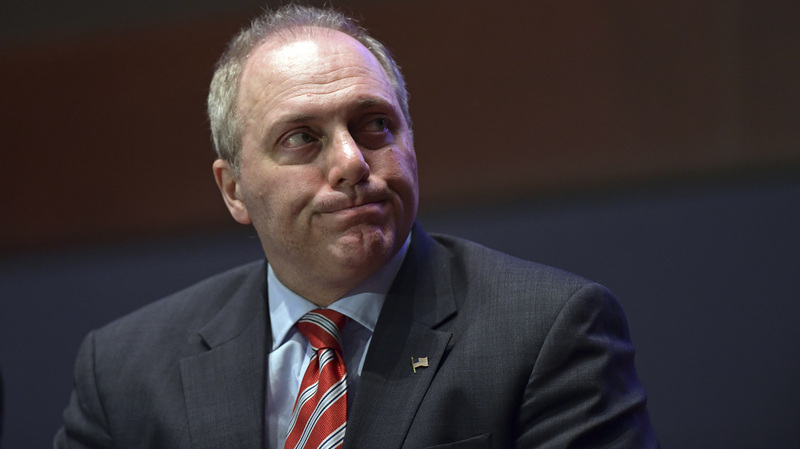 The Republican from Louisiana is expected to undergo another surgery Wednesday. Scalise was wounded when a gunman opened fire on Republican lawmakers practicing in a Washington, D.C., suburb for a charity baseball game. A police officer, a congressional aide and a lobbyist were also shot that day. Scalise was shot in the hip and has had surgeries to repair internal organs and broken bones. In a statement, Scalise said he was "humbled by the outpouring of support and prayers" that he has received. While he didn't provide any details about Wednesday's surgery, he did say that he plans to remain engaged in his work as he heals. He did not give a specific time for his return to Capitol Hill. Scalise has been working on his rehabilitation since he was originally released from the hospital in July. Vice President Pence tweeted Tuesday that he and his wife are looking forward to having Scalise "back in the House to help implement the administration's and Congress' 'America First' agenda." Scalise made an emotional return to Congress in September. NPR's Brian Naylor reported that Scalise was greeted by a standing ovation and cheers from lawmakers on both sides of the aisle. Scalise became the 17th member of Congress shot while in office.